Two years ago, I decided to include a montly pope in with the Saints of the Week, but only managed three, St Peter, St Clement, and then alleged Anti-pope St Hippolytus, who I later learned wasn’t an anti-pope at all! Since the Saint of the Week returned the first week of November, enjoy the Pope of the Month on the last! This month, we go back to the days before St Hippolytus to St Victor (Bp of Rome c. 189-198) — a contender for being the first ‘Bishop’ of Rome. One of the most important developments in church organization was that of the monarchical episcopacy, which emerged in the years following the deaths of the Apostles or leaders of the apostolic age in different places at different rates. The letters of St Ignatius of Antioch (d. 117) reveal that Antioch at the time had an episcopacy that seems to have presided over a board of presbyters. Ignatius as bishop had a liturgical function, a role in protecting orthodoxy, and a prophetic role in leading the church. His letters also show us that many churches in Asia Minor had men called bishops at their heads as well. The story of the church at Rome is not uncomplicated in this regard. Was Clement the bishop the way we think of them, or one bishop among several? The Roman church was a large body of believers from early days and also relatively wealthy — wealth that was used by the church functionaries to feed the poor and support the ministers. They seem by the time of Clement to see themselves as a united church, not a varied selection of different communities. 1 Clement and The Shepherd of Hermas reveal a church structure that had a group of officials at its head whose titles were, in the last first and early second centuries, still fluid; is there much difference between a presbyter who presides and the episkopoi? By the middle of the second century, the various churches of the cities of the Mediterranean world were in increasing contact, and this necessitated mutual recognition of leadership. This was the time of proto-orthodoxy seeing various risks to its integrity and the doctrinal soundness of the church in the various groups labelled ‘Gnostic’ as well as the divergent Roman teacher Marcion. Shortly before Victor’s episcopate in Rome, St Irenaeus, bishop of Lyons, gives his famous Apostolic Succession (about which I’ve blogged here) of the city of Rome in Against the Heresies 3.3. Irenaeus finishes with Eleutherius, Victor’s predecessor. This strongly suggests that some form of episcopal monarchy was already established in Rome by the time of Eleutherus’ episcopate. The shape of the episcopacy was yet to be fully determined, however — was he a president over his fellow presbyters or what? Victor comes onto the scene around 189 upon Eleutherus’ death. Victor exercised episcopal authority in a variety of ways. According to the Refutation of All Heresies, Book 9, Chapter VII, Victor used influence at the court of the Emperor Commodus to secure the release of Christian prisoners who were working in the mines of Sardinia. We learn from Eusebius (5.28.6) that he also excommunicated one Theodotus the Tanner for denying Christ’s divinity. Victor is using the office of bishop, that much is clear. He is most famous, however, for his involvement in the Quartodeciman Controversy — a debate on the date of Easter. In this controversy, we see the international role that bishops play in each other’s churches, as well as the fact that the ancient, ‘primitive’ church was an international community that sought unity in all things. Quartodecimans were Christians who celebrated Easter on 14 Nisan, at the same time as Jewish Passover. The primarily lived in Asia Minor. It seems to me that their tradition is probably as old as the accepted celebration of Easter on a Sunday. 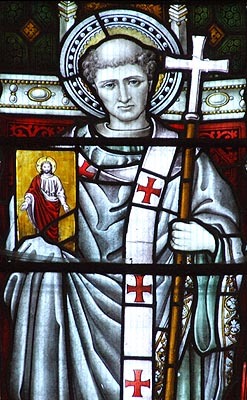 They included in their ranks the celebrated Bishop of Smyrna, St Polycarp. In the days of Anicetus, one of Victor’s predecessors, Polycarp visited Rome, and Anicetus received him warmly, despite their difference over the date of Easter. In the mid- to late 100s, however, the debate heated up. The date of Easter is a big deal throughout Church history, cropping up here, then again around the time of the Council of Nicaea, then again in the 400s, and then famously at the Synod of Whitby in the 600s (my thoughts on that here). Many of today’s Christians probably wonder what the big deal is — who cares which day people celebrate Easter? Well, two immediate thoughts. One is an official reason: Traditionally, people fast before Easter. To have some feasting while others are still fasting is just in appropriate. Second, Easter is the chief feast of the Christian year. It is the reason we are Christians. Jesus rose from the dead. To fail to celebrate Easter at the same time is to compromise Christian unity that is visible in the feasts. Other bishops felt that Victor had gone too far by breaking communion with every single Asian Christian, especially since they seemed to be pretty much orthodox. Amongst the more easygoing bishops were Irenaeus who pointed out that cutting churches off because they follow tradition is a bad idea. As Eusebius says, Irenaeus lived up to his name, peacemaker, and corresponded with Victor and other bishops to find a peaceful resolution to the issue. I guess it seemed to work, since Eusebius does not return to the issue — however, pockets of Quartodecimans continued to exist in Asia Minor for centuries, tradition being on their side. According to St Jerome, he was the author of Latin works of moderate quality. Reports that he was a martyr and was buried near St Peter are routine and should be rejected. Feast 28 July. Why is the Synod of Whitby worth bold letters in the centre of the page? Because the popular myth that surrounds Whitby, one that is intimately linked with modern visions of the ‘Celtic Church’, is that in 664, when King Oswiu and Northumberland chose to follow the current Roman calculations for Easter, they became ‘aligned’ with the Roman Church against the ‘Celtic’ Church in a clash of civilisations and worldviews. It was free-spirited Celt vs bureaucratic, legalistic Roman. Many people call 664 the end of Celtic Christianity. If you’re interested in Celtic spirituality, don’t look any later than this. So, especially since the gathering was called by the King of Northumberland, it seems the perfect fit for the nastiness that is the official church and its organisms after Constantine ruined everything by daring to give bishops tax-free status. I just read Benedicta Ward’s little booklet A True Easter: The Synod of Whiby 664 AD, and, well, the truth is messier and, quite frankly, doesn’t support the above reading which draws more upon nineteenth-century nationalism and contemporary Protestant/agnostic searches for early (Christian) spirituality that doesn’t require the presence of a Bishop in Rome. First, what was this gathering actually about? It was about two things: the date of Easter and how monks should shave their heads. True story. That is all it was about. The latter is not so important. The former, on the other hand, was a big deal all over the ancient and early mediaeval church. Why is the date of Easter a big deal? Why does it matter whether people celebrate it at the same time? Well, as the Venerable Bede points out, when the King of Northumberland celebrated Easter on one date and his Queen another, one would be feasting while the other was fasting (this is how similar the two practices were; basically the date was the only difference). This is the general complaint about different dates of Easter from time immemorial. It also matters because almost the entire liturgical year is centred around Easter; it sets the dates for the fast of Lent as well as the baptisms which traditionally occur at Easter and Pentecost. It was important for the ancient and mediaeval Christians, who lived in an almost completely oral society for whom visible signs meant more than they do today, that those who are united internally — that is, doctrinally — be united visibly as well. The dispute about Easter first pops up, according to tradition, in the late 100s when some Christians in Asia Minor were found to be always celebrating Easter on 14 Nisan, that is, Passover — they were accordingly called Quartodecimans. Some people call the Roman episcopus Victor who sent the letter on this issue to the eastern churches the first ‘Pope’. Whatever that’s worth, Quartodecimans were not the end of such disputes, since calculating Easter is a bit tricky. Constantine, who very often tried to help the church find unity and uniformity in various matters, ruled that everyone should follow the Bishop of Alexandria, since Egyptians are good at astronomy and stuff. This didn’t stop Pope Leo I a little over a hundred years later arguing with the Bishop of Alexandria about what the right date would be. Around 457 (while a frustrated Leo was Bishop of Rome), the Church in Rome decided to follow the Easter tables by Victorius of Aquitaine. This usage spread to the whole western Church that was in communion with the Bishop of Rome, including the Church in Ireland, which was in the process of being evangelised by missionary-bishop-monks sent from Rome. So how do the Rome-evangelised churches in the south of England, and the Ireland-evangelised churches in the north of England end up with different dates for Easter? Well, in 525, everyone’s favourite short monk from Scythia, Dionysius Exiguus, came up with new tables for calculating the date of Easter that would run until 1063. These were a bit better at calculating the combined solar-lunar cycle that determines Easter (apparently a tricky thing to this day), so the Roman Church and those in communion with her on the continent adopted the new cycle. Ireland and Wales (and, as a result, the missions in Scotland and England) did not. I imagine this is because there was not a lot of contact between them and Spain and Gaul (let alone Italy! ), especially since Spain and Gaul were busy being consolidated into barbarian kingdoms at the time, with the occasional invasion by a neighbour. When Augustine of Canterbury turned up in 597, the Welsh Christians resisted his calculation of Easter; for them, it does seem to have been a mark of resistance and individuality. Sixty-seven years later at Whitby, however, the Irish-Roman-trained Anglo-Saxons and Irish who favoured the old Roman dating of Easter, and the Kentish-Roman-trained Anglo-Saxons who favoured the new Roman dating, were all simply appealing to what they saw as the authentic tradition. They had all partnered in mission, and some of them were married to people from the other side of the debate. Theologically, they were in agreement. It was the thorny issue of Easter and how to shave a monk’s head over which they disagreed. As Benedicta Ward paints the scene, this was a meeting of friends, of Christians who loved one another who wanted to solve a problem. Except possibly Oswiu, for whom this was also a matter of secular politicking. Anyway, the new Roman position won. Although Colman resigned his bishopric and monastery, his replacements in Lindisfarne were still Irish-trained; the only difference was the fact that they would follow the new date of Easter. When he left, some of the English monks followed him to Iona. Ward points out that Bede speaks highly of the Irish missionaries and monks, finding their obstinacy concerning dating Easter as the only general fault. Their devotion to the theological truths of Easter he praises. Eventually, all of England, Ireland, Scotland, and the isles adopted the new Roman date of Easter. While this may sound like reading history backwards, it still strikes me as inevitable. The entire church on the continent followed this practice, as did the churches in southern England with a mix in Northumberland. The Church of Late Antiquity and the Early Middle Ages esteemed unity, and the celebration of the Church’s chiefest and principal feast was an important demonstration of that unity. If you’re looking for a Roman church imposing its power over local practices, look not to the Synod of Whitby. For those still curious about the doings of the Classic Christian Reading Group, this past week we read Bede’s account of St. Augustine, in his Ecclesiastical History of the English People Book 1, chh. 23-26, par. 1 of 27, 29, 31, 33, 34; Book 2, Chh. 2, 3. In the year of Our Lord 596, Pope St. Gregory the Great, Doctor of the Church, sent missionaries to the island of Britain to convert the pagan Anglo-Saxon peoples dwelling there. At the head of this expedition was the abbot (for the missionaries were monastics) Augustine (not of Hippo). As these Italian missionaries got closer to the English Channel, they wavered in their commitment. Why on earth were they going amongst a barbarian people who did not worship the Most Holy Trinity, did not honour the name of Christ, had strange customs, and spoke a language they did not even know? They sent Augustine back to Gregory in Rome, but Gregory would hear none of it, but instead exhorted them not to turn back having put their hand to the plough, for it would have been better never to have started at all than to have chickened out in Gaul (France) — a common piece of advice to ancient and mediaeval monks and missionaries. Strengthened by Pope Gregory’s words, they crossed over to the island of Thanet and made their presence known to Ethelbert, King of Kent. Ethelbert went over and met them, allowing them to stay on the island for a while until he was certain of their motives. Ethelbert’s wife was a Frankish princess named Bertha and herself a Catholic Christian (this is in distinction to Arian Vandals or Goths), so he had some knowledge of the faith. Once King Ethelbert was convinced the were of good intent, the missionaries were given an old church in Canterbury to operate from. Although he did not wish to convert at first, since it is a big deal to turn away from the customs and beliefs of one’s ancestors, Ethelbert saw no harm in allowing the Christians to preach among his people, allowing the people of Kent to believe as they chose. If we consider the attitude of a good many Christian princes and bishops at this point in time, King Ethelbert’s tolerance is outstanding. The missionaries lived together in monastic simplicity, sharing everything in common, and providing a stipend to the married missionaries who seem to have been involved in the project. Their simplicity of life, miraculous signs, and clarity of preaching won many souls from among the English. Canterbury became the seat of episcopal power in Kent, and remains the see city for the Church of England to this day. Before long, King Ethelbert converted and was baptised, giving even greater freedom of movement to the missionaries both to preach and to restore old Roman churches that had fallen into disuse during the centuries of the Anglo-Saxon invasion of the old province of Britannia. Such an attitude would seem shocking to people reared on Reformation myths of mediaeval Christianity, or with the knowledge of Charlemagne’s attempts at making all liturgy and practice uniform in the eighth century. Yet this is not so surprising if we consider the vast world of ancient Christianity which spread from Ireland to Mesopotamia and even India and included various cultures. There was and is much similarity among the traditional liturgies, be they Roman, Gallican, Byzantine, Coptic, Syrian, and so forth, but with flexibility for local variation. According to one book I read, this embracing of the good from both the Roman and Celtic practices is what helped shape and form the Use of Sarum, the particular liturgy in use in England until the Reformation. No doubt it was less florid in St. Augustine’s day. This willingness to take what is good from the pre-existing culture is demonstrated in the evidence that remains of Anglo-Saxon Christianity as established by men like Augustine and Cuthbert and as it stood until the coming of the Frenchified Viking Normans in 1066. For example, the Anglo-Saxon Lindisfarne Gospels demonstrate an artistic aesthetic that stands proudly beside the Celtic art of the Book of Kells. Many of the considerations and prayers we find from the Saxons resonate with those we find amongst the monks of Iona. Although there was some clash between the Roman missionary enterprise from the South and East and the Celtic from the North and West, much of what the modern Celtic movement in Christianity treasures existed within Anglo-Saxon Christianity as well. However, the encounters between St. Augustine and the Celts were not all afternoon tea and crumpets. The Celtic Church was not following the same date for Easter as the rest of the Church (ie. the Church from Spain and France to Mesopotamia, from Germany to Ethiopia), and they had their own monastic system. St. Augustine tried to force the Celtic Christians to accept the universal date for Easter and to adopt Roman (ie. Benedictine) monastic practices. They refused; many were slain by an Anglo-Saxon pagan king years later. Bede attributes their deaths to their refusal to submit to St. Augustine. As St. Augustine’s mission grew, he consecrated bishops in London and Rochester. Many of the English became Christians during this time, and because of King Ethelbert’s conversion, many people with senior positions within the realm adopted Christianity or were promoted because they were Christians. Ethelbert did not force his people to convert, maintaining his previous openness to people of other beliefs. In 604, St. Augustine died. The Church he helped found spread throughout all of England, and those worshipping communities have their successors amongst the worldwide Anglicans as well as English Roman Catholics. A great harvest has been reaped, to glory of God Almighty.